Women experience hormonal changes, until their last period – except for the months of pregnancy – in a constant synergy with estrogens, progesterone and the hormones of the pituary gland. Everybody should know that menopause is not a disease, but a biological condition forming because of decreased hormone levels. The climacteric period takes place simultaneously with decreased hormone production of the body. Based on the most recent research menopause is associated with the reduction of estrogen and progesterone levels. At the same time it is confirmed that lacking hormones can be replaced by natural sources of estrogen or progesterone, so the unpleasant consequences can be fought. Contrarily to synthetic hormones, during the use of natural hormones no unpleasant side-effects are formed (uterine cancer, susceptibility to blood clotting, etc.). Based on research experiences it can be stated that symptoms forming in consequence of lacking hormones will disappear if natural hormones are administered. Bones and veins will regain their lost advantageous properties. Natural hormones originated from vegetal extracts are absorbed very well. Natural hormones can be obtained from several plants. The most widely spread among them is a progesterone-like substance gained from Wild Yam (Dioscorea villosa). An active ingredient is easy to extract and transform from Wild Yam. 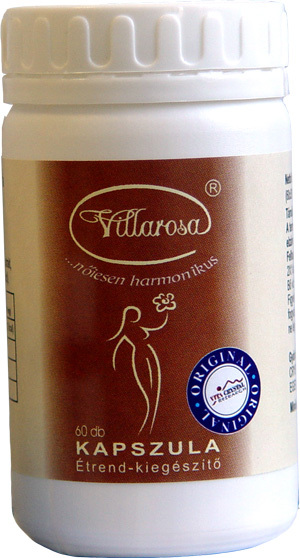 A good quality, reliable, natural hormone product was designed this way, called Villarosa capsules containing phytoprogesteron and flavonoids. It regulates the menstrual cycle, reduces nocturnal sweating. In case of elderly women vaginal dryness is diminished by its use. Harmonizes hormone levels and as a consequence inhibits skin problems forming during menstrual cycles and based on hormonal disorders (e.g. enhanced sebaceous activity, formation of pimples). Also it reduces unpleasant oedema of limbs occurring frequently during menstrual cycles or swelling which forms as a consequence of enhanced water retention of the body. It reduces appetite, therefore it helps to maintain the ideal body weight and facilitates slimming diets. Stimulates sexual activity and has a beneficent effect on fertility. Based on American experiences, unpleasant symptoms of menopause are reduced by 40%. Moreover it reduces triglyceride levels or enhances HDL levels. Flavonoids together with vegetal antioxidants slow down ageing and increase flexibility of vein-walls. 2 capsules daily, with plenty of water.